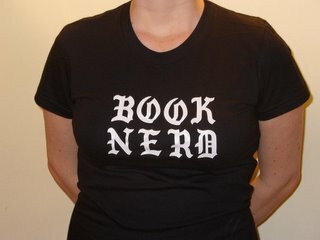 Book Nerd vs. The Universe! Guess what comes out in comic shops today? As you may have noticed, I am somewhat obsessed with this Canadian comic book series by Bryan Lee O'Malley. It's got everything you could want in a comic, or any book really: rock and roll, hapless hero, true love, kung fu, running gags, mysterious backstories, you name it. 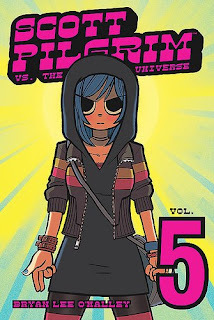 I've been one of the legions waiting breathlessly for the 5th and second-to-last installment, and early reports indicate that the wait has been worthwhile -- Scott Pilgrim vs. The Universe delivers the goods. I wasn't able to make it to last night's midnight release party with O'Malley at Jim Hanley's Universe, nor will I be able to attend this evening's book party with the author at Rocketship (I blame "making a living", which often interferes with my comic book reading.) But you can bet I'm jetting over to Rocketship as soon as they open this morning to pick up the copy the supernice owner Alex has set aside for me. And I harbor hopes of bumping into O'Malley at ComicCon this weekend and getting all fangirly. In any case, I will probably have read SPvTU by the end of today. Hooray for the joys of anticipation!